Replacement conservatory roof system by Guardian Roofs Midlands. 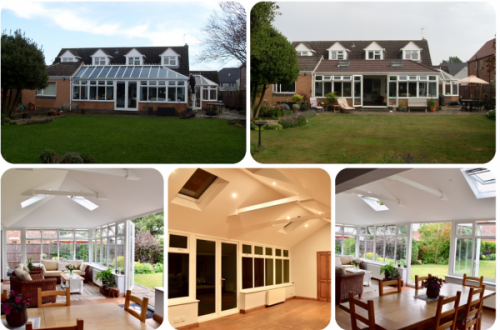 Cannock, England, UK – December 14, 2018: Guardian Roofing Midlands has proudly announced that it is offering a wide range of conservatory roof replacement services to customers in the Birmingham and surrounding areas, England. With high quality services and a full 10-year guarantee on all of its products and services, the roofing company takes great pride in serving as one of the most recognised roofing companies in all of the midlands. Moreover, the company has a dedicated staff that is certified and all of its fitters are Team Guardian approved installers, while the electricians working with the company are NAPIT certified. “Our lightweight, durable and insulated Guardian warm roof system was designed and developed over a ten year period and its primary purpose was to replace the typical glass or polycarbonate roof that was used in the construction of most UK conservatories.” Said the spokesperson of Guardian Roofing Midlands, while introducing the company’s specially developed roofing system. “We feel that it is vitally important to keep our customers in the loop regarding what is going to happen and when, and that is why our representatives are constantly in touch with our valued customers at all times. In addition, the company has also introduced its effective and high in demand roofing system called ‘The Guardian Warm Roof System’. The key focus of its roofing experts has always been on the dynamics and performance, and the overall weight of the replacement roof. By keeping everything in account such as the existing conservatory windows, doors and frames, the company ensures that every installation is perfect and can be supported by the building’s structure. Furthermore, the company also takes weather into account for each project, resulting in the finest and most durable roof installations in all of the UK. In the wide range of services and products offered by the company, conservatory roof replacement has always been the highest in demand and the replacement conservatory roof cost quoted by the company is one of the most reasonable and affordable in the area. Guardian Roofing is also known for its signature Guardian Warm Roof and has been receiving phenomenal reviews and testimonials regarding its roofs and the services provided by its certified experts.